Children and youth are welcome and valued at UCC Longmont. We believe that children aren’t just the future of the church, they’re an important part of our community right now. We work hard to include them in all things. There’s a table with activity bags, books and coloring pages at the back of the sanctuary. We also have a Cuddle Room at the back of the sanctuary for the convenience and comfort of kids and their parents. This room has toys, a crib and comfortable adult furniture. Feel free to use it anytime but know that it’s just as common to see kids working their wiggles off in back of the sanctuary or standing in the aisle to get a better view of what’s happening in front. We also have a staffed nursery for kids 0-preschool. Our two nursery attendants will be happy to watch your kids while you attend the service. You can drop them off anytime after 9:00 am and pick them up after the service. Most Sundays, we offer the older children the option of attending a special Children’s Worship during the regular service. Children’s Worship is led by either Rev. Amelia or a trained, background checked volunteer. Elementary school children start out in the sanctuary with their families and then may leave for Children’s Worship after the children’s sermon. In Children’s Worship, they do many of the same things folks are doing in the sanctuary but in a format that’s geared for young worshippers. As a group, we pray, hear a Bible story, think about it’s meaning and sing. Kids return to the sanctuary during the offering. Because we believe it’s important for all of us to worship together, we also designate First Sundays as intentionally multi-generational worship services. 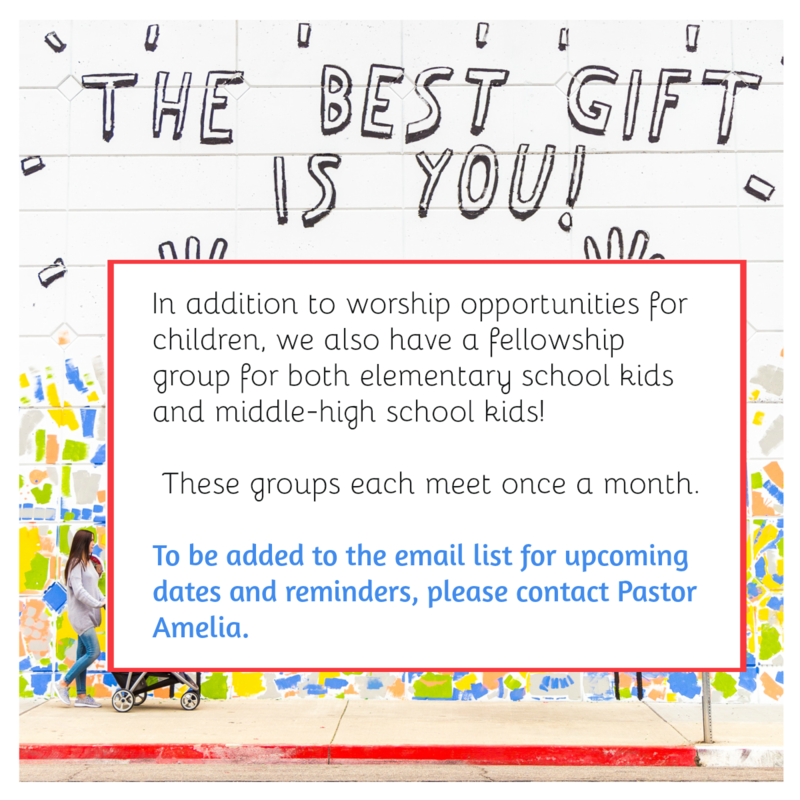 On the first Sunday of each month, a separate Children’s Worship isn’t offered. (The nursery is still available if you’d like.) Instead, the entire congregation stays together in the sanctuary for worship and communion. During the church year, we also designate some special holidays in multi-generational worship services: Christmas Eve, Christmas, Ash Wednesday, Maundy Thursday, Easter and Pentecost as well as other special services that may come up throughout our congregational life.